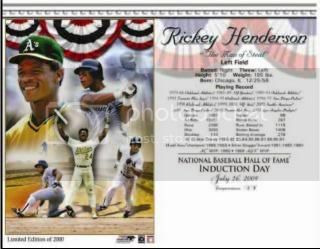 I just received an e-mail today with Hall of Fame Induction Day Cards that PhotoFile is going to release. I've seen the image on a PhotoFile 8x10 that is currently for sale, but had not yet seen the induction day version. The flyer lists the retail price at $4.95, which is right around what you'd usually find these for. There's also a wholesale price of $2.50 each if you buy 50, which does seem tempting, but even with all of the Rickey collectors (and even baseball fans) that I know, I doubt I'd be able to round up enough people to make it worth while. I think I'll just plan on picking one up at the ceremony for $5, as that's probably the easiest thing to do. Now that the merchandise is starting to roll out, I'm getting more and more excited about the upcoming Hall of Fame weekend, which is only about a month away. In finally purchased my airfare, and I reserved the hotel almost a year ago, and now all that is left is the rental car. As I've mentioned many times before, I can't wait! Hi, Thank you for the publicity. I invented the "Induction Day Card" in 1984. They have been offered each year since, except last year. So, I didn't want to miss another year. I had my ex partners at Photo File print them and I (TCMA Ltd.) bought the entire press run. I hope everyone knows that the blank spot on the right side of the card is for a stamp and USPS cancel. I haven't seen the cancel yet but I know that it is a pictorial and the Cooperstown PO will be open Sunday to sell stamps and apply the cancel. Very nice. I am counting down rhe days to when I can read your report from Cooperstown!!! These cards are available directly from us (TCMA Ltd.) but we have a minimum order of 50 pcs. Otherwise, you will be able to pick up individual cards throughout induction day weekend in Cooperstown. As usual, many of the shops in town will be carrying them. Try "Baseball Nostalgia" across from Doubleday Field. I thought I would help out the fellow that was looking for these cards. I also collect these so after reading Mike's post I called Baseball Nostalgia and the gentleman told me they've had these in stock since June. I ordered 5 Jim Rice cards (I don't collect Rickey) at $4 each. Very psyched b/c I'm seeing Rice on 8/10 so all I need now is a HOF plaque and I'll be all set. Thanks for the additional info TCMA, and for the followup info Anonymous. But, I believe there are actually two versions of this artwork. There's the 8x10 version, featuring just the artwork, which is what I believe that Anonymous bought from Baseball Nostalgia. But, there's also the induction day card version, with the text on the side, that will also feature a postal cancellation on the day of the ceremony. These are not available yet, since they must actually be cancelled by the post office. MOS, I actually purchased the same card you have pictured above, only for Rice. These aren't sold with the stamp and USPS cancel. That's something you get at the Cooperstown PO after you purchase the induction card at another store. (to my knowledge the PO does not sell the cards.) I use the cards to get signed so I'm not concerned about the stamp or cancel.